Vegetable casseroles are a great way to enjoy fresh produce from the farmers market or make use of a bumper crop. But they can also be loaded with cream and cheese making for a very heavy and high-caloric dish. 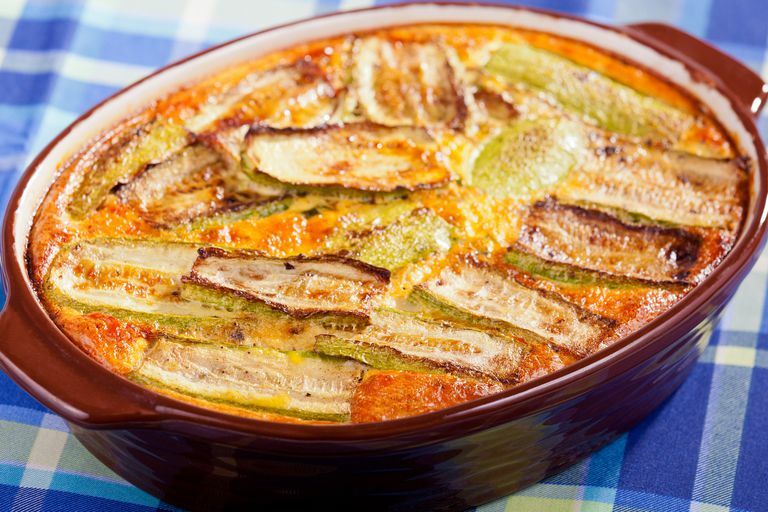 To make this zucchini casserole recipe healthier, instead of adding cream to the sauce it is enriched with tomatoes, onion, garlic, and herbs. The zucchini is then topped with just a bit of cheese. You may notice the ​absence of breadcrumbs, which also helps cut down on the calories. To compensate for the breadcrumbs' job of soaking up some of the liquid the vegetables exude during cooking, this recipe calls for starting the casserole on a higher heat to dry it out a bit, and then adding the last of the cheese on the top (otherwise it gets too brown or could even burn). This zucchini casserole recipe works well with any kind of zucchini or green summer squash, including a combination of squashes. Heat the olive oil in a medium saucepan. Sauté the onion in the oil for 2 to 3 minutes, then add the garlic and cook for another 30 to 60 seconds, until the garlic is fragrant. Cut each tomato into 3 to 5 pieces and add to the oil, along with the herbs, salt, and pepper. Cook over medium heat until the liquid is mostly gone (but not dry), stirring occasionally—you should end up without about 1 cup of the mixture. This should take about 5 to 10 minutes. Meanwhile, cut the zucchini into slices approximately 1/4 inch thick. These can be either round slices, or lengthwise. Take the largest slices and line the bottom of a 9x9-inch or 8x8-inch pan, or a similarly-sized round pan. Spread about 1/4 of the tomatoes on top of the zucchini (don't even try to spread evenly; it won't work), followed by 1/4 cup of the cheese. Continue layering the sauce, zucchini, and cheese. It should come out to 4 layers, but if it only makes 3, just try to divide things relatively evenly. Don't put the final layer of cheese on yet. Bake for 20 minutes. Top with the rest of the cheese, and lower the temperature to 375F. Bake for about 20 minutes, or until the cheese is golden brown. If you'd like to cut down on the fat even more, substitute low-fat or fat-free cheese. Just keep in mind that when you remove the fat, you also lessen the cheeses' melt-ability. How Do Make a Delicious Beef Vegetable Soup?